Palace On Wheels - Ultimate Luxury Travel ! ! Rajasthan is a land cocooned in royalty and beauty. In the state, the royalty is not only visible in the stunning palaces located on islands, hills and plains but can also be experienced on the wheels. Palace on Wheels is one of the most luxurious trains in the world. A ride in this train transports you into the days of yore. Why not board it and live like a king/queen for a week! The Palace on wheel was once the private transport vehicle of the Maharajas of the bygone era whose life style was high on comfort and luxury. During that period the entry into it was forbidden, but now it cordially invites anyone and everyone who wants to take a leap into the lavish era. But it does not come cheap. The train has been rated as one of the ten best luxurious trains of the world. The train was inaugurated on 26th January, 1982. It offers 8 days / 7 night’s tour. The Palace on Wheels is perfectly soaked in traditional beauty coupled with modern facilities which offers a memorable journey. The train has a capacity of accommodating 100 passengers at a time. 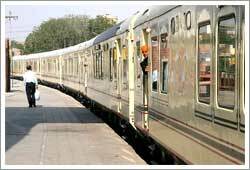 The Maharaja and the Maharani are the royal titles given to the two huge restaurants in the train. The lavish and the traditional aura of the restaurants add more flavor to the taste of the travelers. They serve Continental, Chinese, Indian and traditional Rajasthani cuisines. The well stocked bar of the train gives you a 'high'. The Palace on Wheels departs from beautiful Delhi and travels around the pink city Jaipur, the golden city Jaisalmer, the glorious Jodhpur, the National Park Ranthambhor, the brave Chittorgarh, city of Lakes and Palaces Udaipur, the bird paradise Bharatpur sanctuary and the romantic Agra. After covering all these mesmerizing destinations the train comes back to Delhi on the eighth day. Here you will get best of everything, be it dining or accommodation, shopping and sightseeing. You just relax and get wrapped up in luxury!